Right around the time Henry Ford was driving the last Model T off the assembly line in 1927, he and tire maven Harvey Firestone took a trip to Los Angeles to select locations for their new factories. Friends say Ford wanted to be near the ocean and picked Long Beach and suggested Firestone go to South Gate. The tiny community southeast of Downtown was mostly agriculture at the time and Firestone found 40 acres of beanfield to house his new manufacturing plant. Architects Curlett and Beelman created a spectacular four-story Italianate complex, with its own power plant and gorgeous polychrome murals by Gladding McBean depicting the tire and rubber-making process. A year after the plant opened in 1928 it doubled in size. By 1954, when they added the Corporal guided missile to their offerings, the plant was nearly a million square feet. 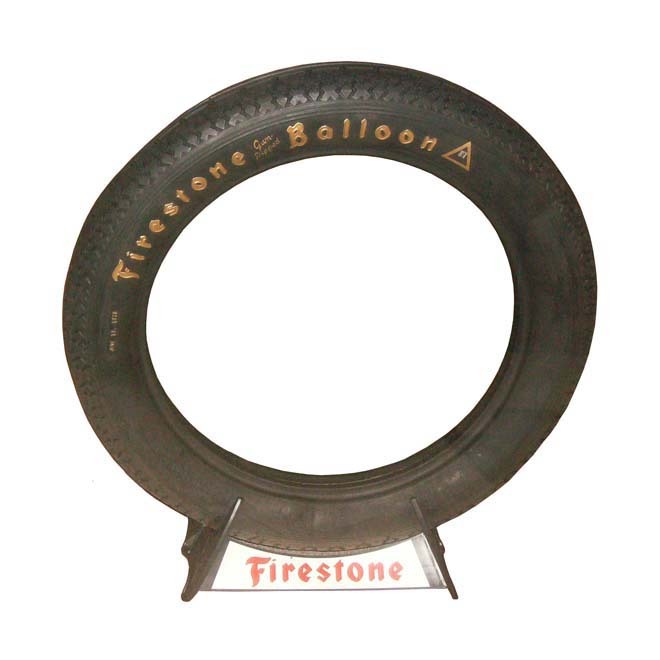 The town grew around Firestone, they named the main boulevard through town after Harvey, and Los Angeles became the number one tire market in the country. Goodyear, Goodrich, and Uniroyal also made tires here (The Citadel Outlet mall was once a tire factory) and they provided union-wage jobs for thousands. By the mid-70’s Ford and GM had massive layoffs as Firestone and other manufacturers opened new plants in non-union locales like Wilson, North Carolina. After much downsizing the end came in 1980 when 1,300 workers were laid off and the plant closed. For a time, office furniture was made there (today the town’s biggest industry is fancy blue jeans) but today most of the space is empty except for a small school. East Los Angeles College has proposed a new satellite campus at the site. Harvey Firestone himself created this tire, the first one off the line at the South Gate plant on June 15, 1928. It is on display at the South Gate Civic Center Museum.